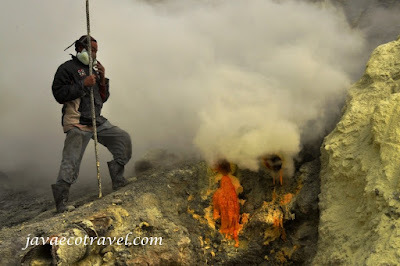 Where does the sulfur from Ijen Crater go after the mining? Ijen Crater is the biggest sulfur producer in Indonesia. There are hundreds of workers mining the sulfur manually. Normally, some of the miners start to collect the sulfur from the crater on the early morning. In average a worker will carry around 70 kilograms on their shoulder. 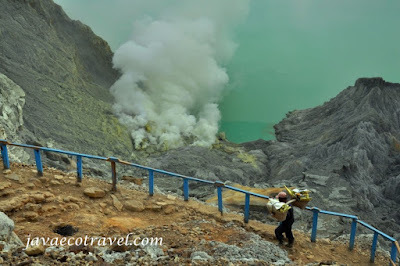 They must carry the sulfur all the way up 200 meters from the bottom of the crater to the rim crater and down 3 kilometers to the storing house. But, where does the Ijen sulfur go after? and what do they do to the sulfur? Not many people know where the sulfur go after the mining, and what the next process. Javaecotravel did a research about it. It will be incomplete to witness the mining process without knowing where the sulfur will go from the crater. We found some facts, that the sulfur carried by the miners is actually not a pure sulfur. There are gravel and sand hidden inside the yellow color of sulfur. Therefore, to separate the dirt from the sulfur is essential. Transported by truck around 45 minutes drive from the Ijen storing house to a small factory, tons of sulfur are being purified with a very simple way. The worker simply melt the sulfur on a big hot pans. As the sulfur melted, they pour the liquid sulfur on a filtering bucket. As a result, pure sulfur will be separated from the dirt, and ready for industrial use on a chemical company, rubber processing industry, cosmetic industry, or firework Industry. Please check the video bellow to get more understanding about the filtering method.